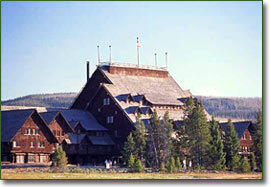 The Old Faithful Inn was originally built in 1904, located adjacent to the famous geyser. The lodge is rustic in styling, with log and wood shingles used for the exterior. The Inn was added onto in the teens and 1920s, giving it an East Wing and a West Wingto accommodate more visitors. The rooms have been recently remodeled, allowing guests to have the top of the line in amenities and luxurious creature comforts, and being able to enjoy them only a matter of yards from the natural wonder of the Old Faithful geyser. This is one of the most popular lodging choices for visitors to the park, so you’ll need to book your stay long in advance if you want a room. Guest rooms at the Old Faithful Inn include those with baths as well as rooms without, for a more rustic and less luxurious approach to your vacation. There is a full service restaurant, a gift store, a deli, and guided tours which are available to all guests of the Inn. Televisions, radios, internet hook-ups and air conditioning are not available in the Old Faithful Inn to preserve the natural surroundings and environment of the area. There is also no smoking, for obvious reasons, and wheelchair access is available on a limited basis for those people who need it. Old Faithful Inn was once just a house for those who visited the area with a few rooms. It is now an expansive lodge including suites, semi-suites, premium rooms, high-range rooms, mid-range rooms, rooms without baths, and accessible rooms for handicapped visitors. The suites come complete with sitting rooms and two queen beds, and also include a full bathroom with a tub/shower, toilet and sink. The Semi-suites have the same amenities as the suites, except for the refrigerator and are slightly smaller in size. Premium rooms include two double beds and a private bath, while high range rooms allow you to choose between a queen bed and two double beds. These rooms come with a private bath. Mid-range rooms are simple rooms located in the old house, and rooms without baths are also located in the old house. They contain queen size beds and a sink, with shared baths located down the hall. The accessible rooms are well-appointed and some of the nicer rooms in the Old Faithful Inn, for various reasons. They are designed for individuals who need accessible lodging, and are available on a limited basis. Renting a room at Old Faithful Inn can be a great way for you to enjoy your Yellowstone vacation and sleep in the shadows of this amazing natural wonder.